VIBURNUM – Members of FBC Viburnum install a new roof as part of their ‘Love Thy Neighbor’ initiative to bless their community with the love of Christ. VIBURNUM – She had a 6-foot-wide hole in her roof and a 55-gallon drum catching rainwater in her living room. Retired after 35 years in the Viburnum school district and now living with her son who was diagnosed with cancer, Love Thy Neighbor gave this elderly widow a brand new roof. A couple years ago, the team did a partial roof for an elderly couple in Lesterville, located just outside of Viburnum. 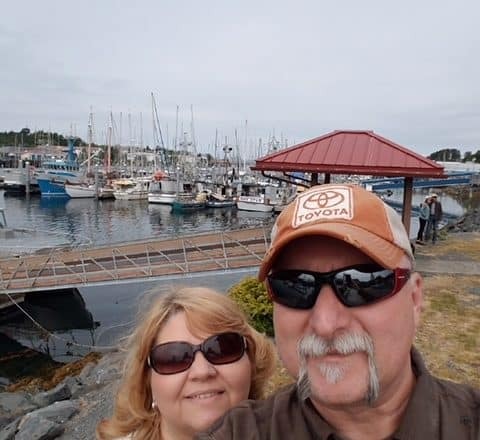 The husband had been battling cancer for quite some time and he told crew members he didn’t think he would make it much longer, but was so thankful that his home was taken care of for his wife. Love Thy Neighbor is a weeklong community home repair outreach organized by FBC. 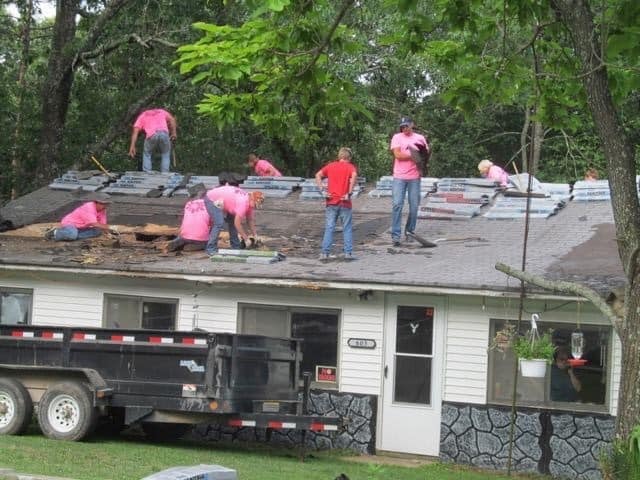 Scheduled for July 1-5 this year, volunteers have raised funds and made plans to put on at least three roofs (maybe more) this summer, which will add to the nine roofs crews have already put on homes since FBC started Love Thy Neighbor four years ago. Along with the roofs, crews have also replaced decks, done exterior renovations, and cleaned up overgrown yards. Every project they take on is 100 percent free of charge to the homeowners. He said each year they are blessed to have between 75-100 volunteers that help with construction, all meals for the week and each night’s worship service. It’s a massive undertaking, and he said they are only able to do it because of community and multi-denominational support. He said one of the biggest impacts Love Thy Neighbor has made is in the healed and strengthened relationships between the Viburnum churches. While many communities end up segmented in their church populations, this project has made it so that the church body as a whole gets to serve together, worship together and be on mission together. But the most important thing Love Thy Neighbor does is provide an answer to the “why question” people have for Christ and for having a relationship with Him. For more information on how to start the Love Thy Neighbor project, Perry said he is more than willing to help other churches get it off the ground in their own communities. His e-mail is pastorjustinperry@gmail.com.